This is an uncut sheet of 24 bills! !....12 bills face up, and the same 12 bills face down, (Bills are printed on both sides) EACH SHEET IS HAND SIGNED & NUMBERED!! YOU MAY OR MAY NOT GET THE NUMBER THAT'S PICTURED, but the "Bills" PICTURED, WILL be the SAME AS WHAT YOU'LL RECEIVE. 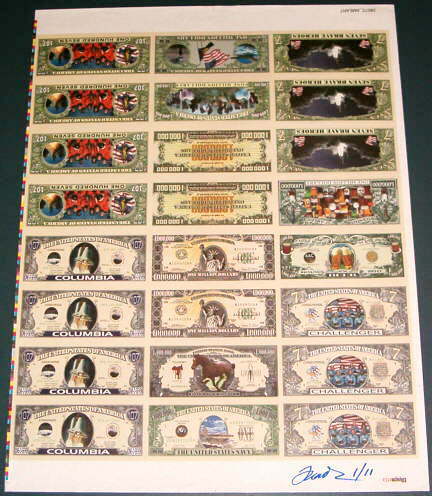 The 24 bills on this sheet are: 8-Space Shuttle Columbia 6-Space Shuttle Challenger 4-2002 IAM Million Dollar bills 2-Beer/Oktoberfest 2-Horse bills 2-Navy bills THESE LOOK GREAT FRAMED! THIS IS A LIMITED EDITION OF ONLY 11 SHEETS!! PRICE IS FOR UNCUT SHEET ONLY...SHEET WILL COME TO YOU ROLLED UP IN A TUBE! This is an UNCUT Sheet of 24 BILLS!....12 bills face up, and the same 12 bills face down, (Bills are printed on both sides) EACH SHEET IS HAND SIGNED & NUMBERED!! YOU MAY OR MAY NOT GET THE NUMBER PICTURED, but the bills PICTURED, WILL be the SAME AS WHAT YOU'LL RECEIVE. 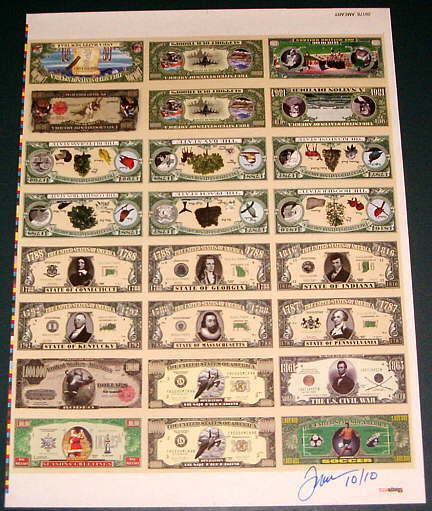 The 24 bills on this sheet are: 4-Iraqi freedom bills, and 2 of each of: Soccer bill, Rodeo bill, Santa Seasons Greetings, Civil War bill, and 2 of each of these State Bills: Indiana, Pennsylvania, Massachusetts, Kentucky, Georgia, and Connecticut.THESE LOOK GREAT FRAMED! THIS IS A LIMITED EDITION OF ONLY 10 SHEETS!! PRICE IS FOR UNCUT SHEET ONLY...SHEET WILL COME TO YOU ROLLED UP IN A TUBE!